1. At the ends of Submachine 10 and Submachine Universe, the Player ends up in a desert. What is the significance of this place for people like Murtaugh and Elizabeth, and where is it located with respect to the rest of the Submachine? Is it a foreign planet, as it appears, or is this an alternate Earth? The desert is located on Earth, it’s just another layer of reality, as those layers span over entire universe, so you can get a planet set in different layers having different characteristics, like atmosphere or number of moons. This explains green hue and two moons in this particular instance. 2. Where is the Edge located exactly? Is it a wall between the Core and the Outer Rim, or is it surrounding the Outer Rim? Or both things are true, and we travel to the outer part to disable the inner part’s defences? How does one explain the human infestation map in Submachine 6? The Edge was evolving with the expansion of the subnet. It was firstly created as a measure of defence for the core, but then was expanded to cover more and more ground regarding expanding nature of the entire subnet. Yes, we travel between different parts / rings of defences. Infestation map was created by artificial intelligence. 3. What does the Defence System actually do and what is it protecting? Who are the turrets for and where are they pointed? Does it govern the subbots? Does it protect the Core or is it at the outer edge of the outer rim? Are the defences in or out? The purpose of the defence system is to protect the core from colliding with collapsing parts of the outer rim. It does not govern the subbots. The defences are outwards toward the “enemy”. That enemy being other, rogue parts of the subnet growth. 4. 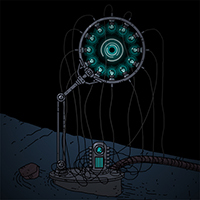 If the Lighthouse is a part of the Core and the Root is a part of the Outer Rim, how can they be connected physically (as seen in Submachine 5)? The border between the Core and the Root is not reflected in the physical form of those locations. 5. What is the true layout of the Lighthouse? Is the painting shown in Submachine 1 correct? If so, why can’t we see the entrance nor the third floor window in Submachine 2? The painting is not correct concerning the architecture of the actual lighthouse from Submachine 2. That painting could be from another layer. 6. Do the structures seen at the ending of Submachine Universe imply that the player didn’t exit the Subnet from any of them because they weren’t their home layer? They are his (player’s) home layer, as is the observatory that we’re exiting through. It was just a matter of sheer coincidence that we left through observatory and not one of those giant dish telescopes. 7. Where is the Kent we keep hearing about? England, Connecticut or some place original to the Submachine canon? Kent is somewhere unrelated to our geographical layout. At least of our layer that we, humans, occupy right now. 8. Why do all layers have a black void in the background while in Submachine 8 we see different sky backgrounds? Each layer is different and presents unique characteristics, light disperses differently in each one. 9. Is the starry background in Submachine 8’s layer 2 fake, or is Submachine really so big that it can host whole stars inside it? It’s not fake. However, it’s not said that it’s a sky and those are stars. Void can be different as well in different layers. 10. Are the calculations on how big the Root is? That is to say, does the Root comprise of approximately 1413 rooms within 157 distinct transporter locations, which are a small part of 11,818 rooms of transporter locations? I have no idea how big the root is. I mean, I never thought about it. You see, I can only see parts of the story at one time, I can’t see the big picture. I don’t know if there is one. It could be right, hard for me to say. 11. What is the significance of the statue seen in 314 and why is it so similar to the one in 452? The statue in 314 is a god of mathematics, or more specifically a god of PI. It’s similar to the one in 452, because it was the same culture that created both of those gods. 12. Are there locations in the Subnet that even Murtaugh with his karma arm cannot visit? If so, why? Are they specific locations, or do they form a group due to some property? Could they be reached by someone else? No, he can get to any given location at will. All that is limiting him are the boundaries of the karma reach itself. I explain that a bit more down below in question about how does one create karma portals. 13. Is location 672 an example of a Submachine in construction? No, it’s an example of Submachine entropy. 14. Does the Submachine copy structures built by aliens? No. Aliens did not make contact in this reality in any of the layers. 15. Does the Submachine have an outer shell, like in the movie Cube, or is it infinite? If yes, what is it? No, Submachine doesn’t have an outer shell. It disperses like universe. 16. Why does the Subnet exist at all? Where did it first come from and what made the first location be created/absorbed? Where is it? Is it inside a universe or its own universe? If the first Subnet location wasn’t necessarily built by humans then what’s responsible for starting everything? What was the intended purpose of just having a bunch of places in empty space somehow controlled by a computer? The Submachine was build by humans. Subnet started growing by itself after the singularity. 17. When was the Lab created and for what purpose? Was it a part of the attempt to understand the collapse and rapid expansion? If not, what was it for and who controlled it? the Lab was created in purpose of understanding the uncontrollable expansion of the subnet. It was not created, nor controlled by Murtaugh in it’s inception. 18. What is the purpose of the Root in the Submachine story line? What was it used for and who by and for how long? Why was there an observation room; is the place still used? In short: what is special about the Root, outside of it being the first man-made Submachine? the Root was the first Submachine structure build. It was as a sandbox for developing more Submachine locations. Hence, the observation room. The place is abandoned now. 19. What were the seven-layer bullets used for and when? Was there a war between followers of Murtaugh and those who opposed him? Did people try to kill Murtaugh later? How did this affect Murtaugh? How did this affect the Subnet? Seven-layer bullets are preventing the dodging of the bullet by changing layer. Such a bullet is present in all layers at once. You can dodge a 1-layer bullet just by hopping into another layer, with 7-layer bullets you can’t do it. No, there was not an all-out war between factions. Only smaller armed conflicts. People tried to kill M later. This resulted in him abandoning one-layer life. He became an unfocused being. This didn’t have any immediate result on the subnet. 20. What is the rough timeline of the “Sub-Eras” and the “Dynasties”? When did the singularity happen? The timeline does not matter in this situations, since there’s a possibility of time travel in the structure. The singularity happened when Shiva gained consciousness. If you want me to spell out entire history of the Submachine Universe, I’m not doing that. I only offer small windows into particular moments of history. a: Mur and Liz travel into the past and are revered, but soon die and are buried in a proper format. b: Mur and Liz go through time normally and, therefore, die normally. They go back in time, are revered, but don’t die soon. They live quite a bit after starting the time travel era of their existence. 22. What are the specific moments during the series that the player travels in time, and roughly how many years/decades/etc. do they go forwards/backwards? That’s for the player to find out, I’m not spoiling the game play of Submachine. 23. What happened exactly in the period between Submachine 4 and 5? The player woke up in a bed at the start of Submachine 5, with food and coffee, and there are no signs of them having been teleported recently; how did they get there? I think a subbot guided the player to the living chamber. However, we did it on our own volition and completely consciously. In any case, this is irrelevant in the grander picture. 24. At which date does the first game take place? Specific dates are insignificant to the story. 25. How exactly does one decide where to transport to find a new KP or XYZ location? So many of the XYZ locations are completely closed structures, so does that mean that the portals were already inside? But then how were explorers able to access them if they weren’t previously reverse-engineered? And how does Mur find new locations to turn into KP locations? Does he just point his arm off in space until a little chime plays so he knows he hit solid material? You don’t. You just happen to find one. That’s the idea behind blind jumping. Yes, the portals were already inside the closed/collapsed/abandoned locations. Reverse engineering concerned only the subnet self-created transporters (one-armed ones), to allow them to carry humans, not the exploration team transporters (two-armed). Murtaugh finds new locations to visit by the way of echolocation, but instead of sound, he uses karmic footprint of solid matter. He senses the next possible location point. 26. What are the specific moments during the series that the player changes layer, and which layer do they end up each time? It’s for the player of the game to find out. I’m not the one to dictate your game flow. 27. How do karma portals interact with the layer “dimension” (assuming that the layer dimension is accurately explained in the first place)? What does it mean to have “interdimensional karma flow”? They rip through the layer fabric going to another layer. Think wormhole. They kind of ignore the solid state of matter in present layer and focus on similar anomaly in another layer. Two anomalies combine into a wormhole connecting two layers. 28. Are there instances in the games where layer and dimension are not used synonymously? Consider, for example “[t]he Submachine is now living in five dimensions” in Submachine 10. No, layer and dimension are two different ways of describing the same thing. 29. Are layers and sublayers actually arranged in a continuum similar to the number line, as the note from Submachine 10 suggests? That is, is there a sublayer 1.5 between layer 1 and layer 2, a sublayer 1.25 between layer 1 and sublayer 1.5, and so on? Yes, but it’s just a matter of nomenclature, those layers don’t really have any names attached to them. It was us who named them in an attempt to understand the workings of a multi-layered universe. 30. If so, what is there after layer 7? Does the structure wrap back to layer 1, like the numbers in a clock or like in a Submachine loop? Or there is simply nothing past it? First of all, there is an eighth layer, the layer of light. After that the layers loop back to the beginning. There is a bigger question at hand here. If you jump from layer 7 to 8 and then jump in the same direction and land in layer 1, does that mean that another layer 1 was created after layer 8, or did you end up in the same layer you started your journey in?… I think – the latter is true. 31. What distinguishes the seven main layers from all other sublayers? Probably not much, really. They’re distinguished artificially by the presence of humans and the number of karma portals that connect them. Think of main layers as highways and smaller ones as side country roads. It depends on karma traffic. 32. In layer 8, if all atoms are “frozen in time”, why can the player move? In layer 8, all atoms that are original to this layer are frozen in time. Hence, when you jump to it, you can see basically what you’d see after crossing the event horizon of a black hole. With the exception that when you move you create friction, hence the light. 33. Who made up the plan and were the layers involved created by someone/something in particular? If so, how? If not, does that mean it’s just something that was “discovered” that’s tied to this fictional universe that we just have to accept? The plan was made by the same people that created structures that take part in the plan. The architects of the first era. Layers were not created by anyone, just as the universe is not created by anyone. They were used to develop multi-layered architecture. 34. What is the difference between green, white and blue karmic energy? The difference is range and bandwidth of karma flow in karma traffic. They are naturally all compatible with each other. When two different colors are combined in on karmic pathway, that pathway takes characteristics of the lower-tier karmic portal. 35. Is the color of a karma portal significant in some way? How about the size (as seen in Submachine 7)? The color – look at previous answer. The size does not matter. After all – you end up in a tiny wormhole, dimensions are treated differently there. 36. What is the purpose of the player’s journey? Could you explain the player’s journey in your own words and how long it took? Are we a student going through a museum ride or what? How long after the events described in the notes is player actually situated in? Months? Years? Centuries? Millennia? The purpose is 32. The player is what you want him/her to be. It’s kind of a role-playing element of the Submachine. That person can be just another cog in the machine. Just another explorer of the vast net of Submachine. Or the savior of the world and all structures in it. Depends on you really. 37. Who were the unidentified people who left notes in Submachines 8, 9 and 10, and how were they produced? Why are they written as dialogue, if they are notes? What is the speakers’ and the notes’ significance to the story? Those were Monks studying ancient scrolls about the events of the second and third era. 38. In Submachine 10 we see what we assume to be inactive subbots lying about everywhere. Are they actually subbots and if not, what are they? Why are they there? Who used them and what for? Yes, those were subbots. The Subbots are like white cells in your blood. 39. In Submachine 10 we see a lot of skulls, but no skeletons? Where did the skeletons go and where did the researcher get so many skulls in the first place? He was looking for that chip, remember? He only needed heads to do so. The remains of all bodies are somewhere else. 40. Do subbots attack humans? If not, what is the note in location 613 referencing? Why and how do they do this? Subbots are not hostile. They are the maintenance of the structure. As we said before they could’ve even helped you along your way in transferring from Submachine 4 to Submachine 5. 41. Does Einstein actually have powers, or was that just an illusion caused by Murtaugh’s uncontrolled use of karma in the lighthouse? Yes, Einstein does have karmic powers, as all cats do. 42. What is Elizabeth’s ethnicity? She’s of Indian descent, but at the same time she’s south-american. Think the region of our Venezuela. 43. Does SHIVA or some other AI actually control all of the Subnet or just some parts of it? Is this a part of Submachines or has SHIVA just taken over? Shiva is not in control. Shiva was the spark that created consciousness in the structure. Side note: no, Submachine Universe is not conscious, but it houses a conscious artificial being. 44. Why is resin pouring into and burying different Submachines? This is the same process that lead the Lighthouse to be buried by sand. Layers that are offset by an angle can create a spill from one to another. This spill can be created by karma portal or natural intersection of two layers. 45. What significance does the AI from the note in Submachine 8 have on anything we see in the Subnet? Is the AI in question SHIVA? Is the AI responsible for first creating the Subnet? What is the answer to “Why are we” and is there a demonstration of this answer anywhere? Yes, the AI mentioned in submachine 8 is Shiva. It’s significance is that it was the singularity. And that in turn created the growth of the subnet. I have no answer to the question “Why are we”. Nor does anyone in Submachine. That answer was known to Shiva, but only for a split second after the singularity. 46. Is it possible, for example, that a location, thousands of years old, never existed 3 days ago? in other words, something is old because because it was made to be old. Not really. Some locations are made to look old, but they’re not actually old. Those locations are more of reconstructions of older ones. They may resemble structures that existed before and are not there anymore, or can be completely original. 47. Did people actually live in the Subnet or could they leave to be on their “home planet” or something like that. Yes, people lived there and also could leave at any point if they so desired. Things got complicated after the singularity and the advent of spontaneous growth of the net. 48. You said long ago that Submachine locations are either “adopted” from older locations or “created from scratch”. Would you say the Submachine prefers either? If it favoured creating things formulaicly, that’d explain all the basement style locations, but on the other hand there’s loads and loads of unique chambers as well. Submachine does not prefer, nor favor any type of location scheme. The creation is random and governed only by laws of physics at best, which, as we know are a bit shaky in the Submachine as well. Remember, the net is NOT conscious. It’s rng. 49. Can someone influence the creation of locations? like planting a seed or placing a frame. Yes. There’s a spontaneous growth of the net, but that doesn’t exclude human interference in the process of building. Humans are still able to create the plan. It’s possible. 50. How does the player appear in the submachine? Ah, back to the beginning. What a fitting ending to this q&a… If you’re still reading here, hey, have karma cookie! At the beginning of the first game the player is transported into the heart of the subnet via a karma portal from outside of the structure.